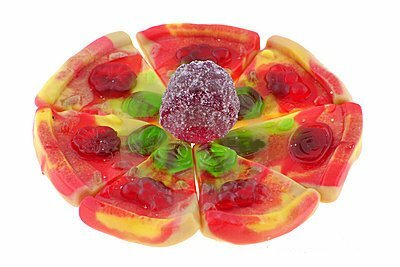 This candy pizza recipe is a great treat for both kids and adults. Here is an awesome dessert pizza recipe that will surely be a crowd-pleaser. Make this recipe for the kid's sleepovers, potlucks or for special occasions. This recipe can be customized a million different ways depending on your favorite candies and flavors. Don't be afraid to modify this recipe as you see fit! And remember, it's a combination of candy and pizza, so it can only be fun and delicious. Store the pizza well-wrapped in cling wrap or in an airtight container in the refrigerator for up to two weeks. Prepare a large baking sheet by lining it with aluminum foil and set aside for now. Place the semi-sweet chips and 1-1/4 cups of white chocolate chips into a large microwave-safe bowl, reserving the remaining 1/4 cup of white chips for decoration. Microwave them in one-minute increments until melted, stirring after every minute to prevent overheating. Once the chips are melted and smooth, stir in the rice crispy cereal and miniature marshmallows, stirring until they are evenly coated and well-distributed throughout the chocolate. Scrape the candy onto the prepared baking sheet and spread it into a thin circle. The circle will be roughly 12" in diameter. Sprinkle the colorful sprinkles (or other candies you are using) on top of the wet chocolate and press gently to adhere them. Sprinkle the shredded coconut all over the top of the pizza. Place the remaining 1/4 cup of white chocolate chips in a small Ziploc bag and microwave it until they are melted, about 30-45 seconds. Knead the chocolate in the bag with your hands to get all of the chips melted and smooth. Cut off a small corner of the bag, and drizzle the melted chocolate over the top of the pizza as a finishing touch. Refrigerate the pizza until it is set, about 45 minutes. To serve, cut or break it into small pieces. Prepare cookie dough per directions. While still warm, add candies to top of crust and gently press into dough. Drizzle frosting over top. Enjoy!